Teaching women how to take back the reigns of thier tongues by the saving grace and power Holy Spirit. I'm so excited about how my eBook'Remove from Me this Venomous Tongue -- How to Stop Destroying Your Family with Your Words' is going to change lives this year. This book deals with overcoming an argumentative communication style and is designed to help you regain control of your tongue. I have prayed over the words and petitioned God to get this ebook into the hands of the women who want to take back the reigns of their mouths. Who is this book for? Women who want to use their words to build up their husbands and children and not tear them down. Women who have tried to stop yelling and arguing but find themselves still struggling. Women who struggle to communicate without becoming angry or easily offended. Why this book will help? Using my mouth to build my husband and children is something I struggled desperately with early in my marriage. Even when I made a decision to change I struggled for about 3 years until I began following the biblical principles I share in my book. 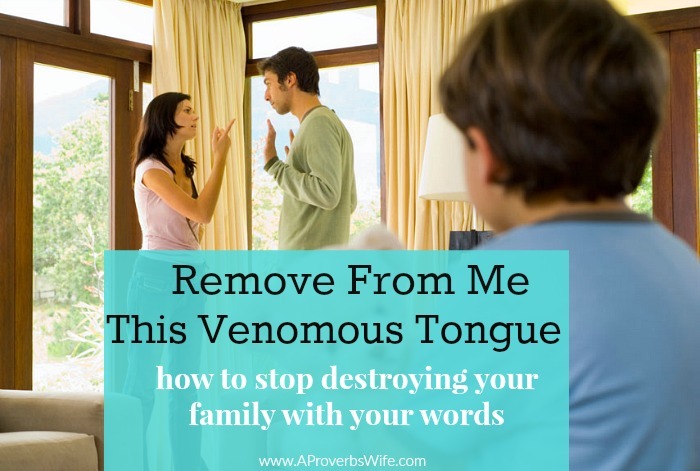 In 'Remove from Me this Venomous Tongue -- How to Stop Destroying Your Family with Your Words' I am very transparent about my struggles and my victories all in an effort to help you overcome your struggle with words. The ebook is 40 pages and can be printed from your computer or read on any ereading device. Order your copy today of 'Remove from Me this Venomous Tongue -- How to Stop Destroying Your Family with Your Words'!